It is definitely cold and flu season and this winter and upcoming spring allergy season, Puffs is here with some great products: Puffs Plus Lotion and Puffs SoftPack. 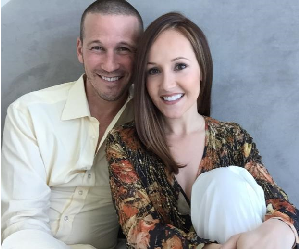 And to help you get through the rest of the cold and flu season, former Bachelorette stars and successful married couple, JP and Ashley Rosenbaum, have some great tips below! They know a thing or two about juggling the demands of a family especially during the challenging cold and flu season. As new parents to son Fordham, they can’t take a sick day; instead they have a few methods that help them power through and recharge when a cold or flu hits their family. Show the Love: When one of us is feeling under the weather, we try to find ways to cheer the other person up— like slipping a little love note under a cup of tea or a bowl of chicken noodle soup! Being sick isn’t a glamorous part of marriage but using these simple moments to show how much you love your significant other, sniffles and all, goes a long way! Embrace Healthy Living: It’s important to take care of yourself all year long, but especially during cold and flu season. We love doing family activities that are healthy but also fun! Taking the baby for a long walk or a hike is one of our favorite things to do, and we also try to eat foods that will boost our immune system to try and keep sickness at bay. Power Through: When sickness has hit but staying in bed is not an option, I always use a good eye cream to remove puffiness and or dark circles, it makes such a difference! Right JP?! Cozy Up: When the cold or flu hits hard, there is something so comforting about putting on cozy PJ’s, having a big bowl of chicken noodle soup, a cup of tea and curling up on the couch with a good movie. Pass the Puffs: Getting sick can be really tough on your face and nose, especially if you live in a cold-weather climate! Puffs Plus Lotion has Shae butter, Aloe, and Vitamin E so it’s always gentle on sensitive skin. We constantly have Puffs tucked in places around the house so they’re always on hand when you need them. Recharge: While sleep can be tough to accomplish as new parents, we always try to find ways to support each other so we can make this happen (even just for a little!) when one of us is feeling under the weather. It’s amazing what a little R&R can do to help you on the path to recovery. My husband is a really big fan of Puffs Plus Lotion because it is soothing and gentle! Puffs® Plus Lotion is their most soothing tissue with Air-fluffed™ pillows for more cushiony thickness. Puffs® Plus Lotion is gentle on sensitive skin and contain a touch of Shea Butter, Aloe and Vitamin E to provide comfort for sniffles, sneezes and everything your face has to face. Puffs® Plus Lotion is available in cube, rectangular and to-go formats online and at local retailers nationwide. And I am a big fan of Puffs SoftPack! They are so great to fit in the car, in my purse...pretty much EVERYWHERE! Puffs SoftPack™ includes Puffs Basic tissues packaged in a full-size, but flexible package that fits in every aspect of your life. The sturdy packaging stays presentable throughout usage – no matter how hectic life around you gets. A face in need deserves Puffs indeed! You can purchase Puffs Plus Lotion for 1 cube (56 ct): $1.79 and 1 rectangular box (124 ct): $2.49. Puffs SoftPack™ is available in retail stores throughout the US and can be purchased in a pack of 132 2-ply tissues. Pricing is at the sole discretion of the retailer.